HÀ NỘI — VUS-HCM City won the 15th stage of the HCM City Television Cycling Tournament yesterday. The five-member crew finished first in the team time trial event. They completed the 48km stage around Nha Trang City of Khánh Hòa Province in a time of 55min 17.43sec. The win pushed them up in the team ranking, narrowing the gap to 29sec with the leading crew of Military Zone 7, who finished in fifth place. Hạt Ngọc Trời An Giang and Domesco Đồng Tháp were second and third, respectively. 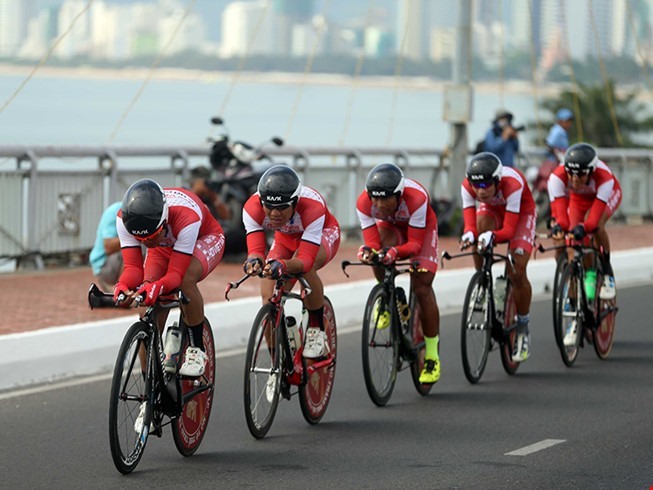 Bikelife Đồng Nai tried their best to enter the top three to maintain their athlete Nguyễn Văn Dương’s leading position in the overall ranking. However, with the crew coming fourth, Dương keeps his yellow jersey (33hr 53.51min), but his gap with the others has been narrowed from more than four minutes to only 41.34sec. The Laotian cyclist is currently in second place, followed by Nguyễn Hoàng Giang of Hạt Ngọc Trời An Giang.